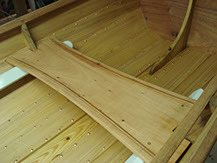 This unique version of a traditional Norwegian pram is built with cedar planking and locust frames. 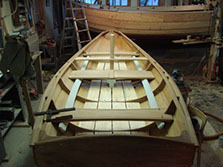 Gorgeous mahogany transoms, rails and seats make this boat really stand out. Lengths can vary between 9 and 16 feet and accommodate up to a 8 hp outboard motor or be adapted for sail. Very stable and easy to row, this boat makes a magnificent tender which can be nested or hung on davits.